The Toronto Transit Commission (TTC) recently announced that construction would be delayed one year at Dupont Station due to difficulties with the third-party contractor in charge of the project. Elevators are being installed at the Dupont Street and Spadina Road station, which has led to regular traffic delays at the intersection. 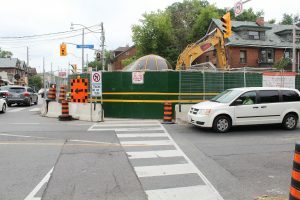 Joe Cressy (Ward 20, Trinity-Spadina) characterized the delay as “unacceptable” and said that the TTC will monitor work at the site for six weeks, and request a recovery schedule for the lost time. Green added that it is not yet clear whether the TTC will issue financial penalties to the contractor, because meetings between the TTC and the contractor about completing the project sooner are still ongoing. However, that is not the only problem with the construction. The Dupont Station construction is part of an ongoing initiative to make the TTC more accessible. Currently 44 stations are fully accessible, and Green says the TTC wants all of its 75 stations to be accessible by 2025. How about putting some of that money into installing washrooms. A very limited section of the public require elevators, but everyone uses washrooms.